The Bristol Cathedral Consort was launched in 2009. 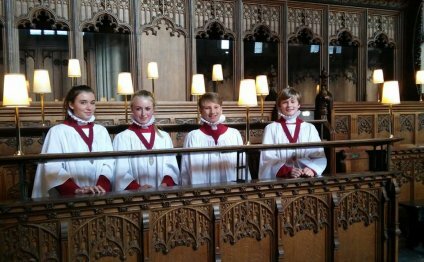 It is a choir which not only enhances the worship of the Cathedral, but also provides an opportunity for young people to develop their singing skills to a professional standard. They also enjoy the social side of being part of such a close knit team. The Consort is open to membership from across the city. It rehearses weekly and usually sings Choral Evensong twice a month. It also collaborates with other choirs in the Cathedral, such as Bristol Cathedral Concert Choir, to perform concerts of large scale works with orchestral accompaniment. The experience offered is particularly valuable to those who wish to apply for choral scholarships at universities like Oxford and Cambridge. The girls of the Consort have been an important part of the Cathedral’s musical life since 1993. In May 2002, as part of Bristol Cathedral Festival, they sang with the internationally renowned soprano Emma Kirkby, at which time she agreed to become Patron of the Choir. The Cathedral Consort has toured most recently to Toulouse, performing in St Sernin, the Temple Du Salin, and previously have been on tour to Belgium included performances at Brussels and Antwerp Cathedrals, Ireland including performances at St. Anne’s Cathedral in Belfast, and St. Patrick’s Cathedral in Dublin.